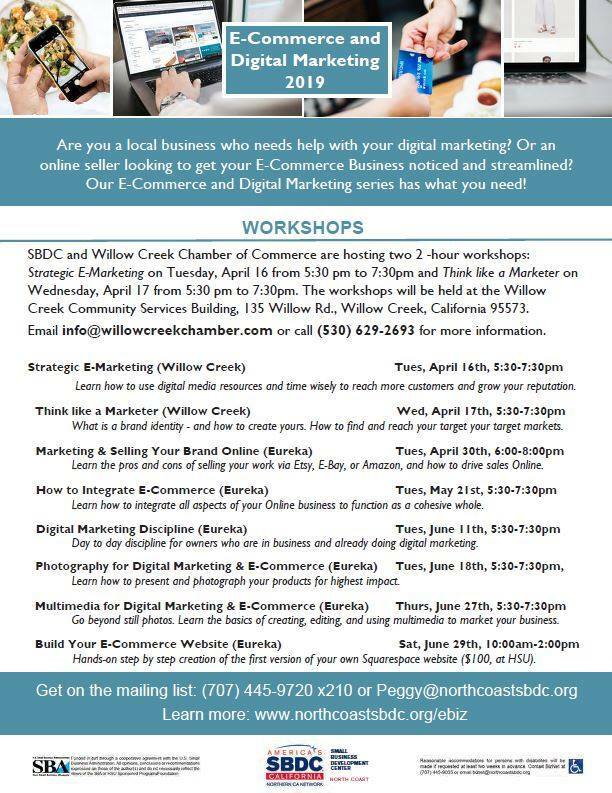 To anyone who is a business owner, works for a nonprofit, or generally interested in marketing, there are two upcoming SBDC marketing workshop opportunities in Willow Creek, CA next week. In detail, the first workshop, Strategic E-Marketing, will take place at the Willow Creek Community Service District Building on Tuesday, April 16th, 2019 5:30 pm sharp. While the second workshop, Think like a Marketer, will take place at the Willow Creek Community Service District Building on Wednesday, April 17th, 2019 5:30 pm sharp. Additionally, as a special note, if the attendance goes well at these workshops, there will be opportunities to have more local business workshops. For more information, please check out the link from the Willow Creek Chamber of Commerce below OR call 530-629-2693.